Following in the footsteps of the C 400 X which was announced last year, BMW have now announced the C 400 GT, expected to arrive in the first half of 2019, alongside the X, and provides what BMW describe as a ‘Gran Turismo’ variation on the mid-range scooter. Designed as a versatile option the C 400 GT is at home riding into the city centre, travelling to the office or enjoying a tour over the weekend – not just as alone but with a passenger, too. High torque and CVT gearbox. 25kW (34hp) at 7500 rpm and 35Nm at 6000rpm. The drive unit of the C 400 GT has been developed to directly integrate the CVT gearbox as well as a secondary drive in the form of a drivetrain swing arm. The liquid-cooled single-cylinder engine has a capacity of 350cc, thanks to a 80mm bore and a 69.6mm stroke. Its rated power output is 25kW (34hp) at 7500rpm and the maximum torque of 35Nm is reached at 6000rpm. The maximum engine speed is 8800rpm, and the C 400 is LAMS legal in Australia. 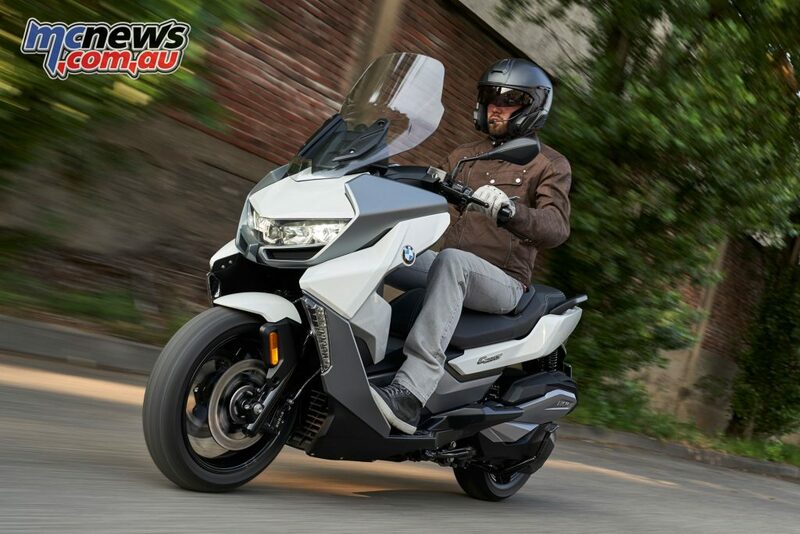 The liquid-cooled single-cylinder engine has been created with a horizontal, forward-facing cylinder. This makes for a low installation position of the engine, favourable for the overall centre of gravity while at the same time allowing for the step-through that is typical of a scooter. A high level of running smoothness is ensured by a counterbalance shaft positioned above the camshaft which is powered directly by the latter via a spur gear. It rotates in the opposite direction to the camshaft, counterbalancing almost perfectly and reducing vibration to an absolute minimum. In addition, the entire drive unit is connected to the suspension by silent blocks for vibration decoupling. The four valves in the combustion chamber are controlled by means of an overhead camshaft powered by a roller chain and two forked rocker arms. The roller chain is guided by a slide rail, with a manually adjustable mechanism ensuring the correct tension. On the intake side the valve angle is 13 degrees while on the exhaust side it is 14.5 degrees to the longitudinal axis of the cylinder. The compression ratio is 11.5:1. The diameter of the valve heads is 32.5 mm on the intake side and 27.2 mm on the exhaust side. Carburation is taken care of by an EFI system with a desmodromically activated 40mm throttle valve unit and a very compact BMS-E2 engine control. Drawing on additional engine and environmental parameters (including engine temperature, air temperature and ambient air pressure), the engine control calculates individual figures for injection quantity and ignition timing. The fuel tank has a capacity of 12.8 litres for 95 octane (four litres reserve). The engine housing is compact in design and made of die-cast aluminium. An oil pump driven by a spur gear takes care of lubricant circulation: an electronic oil warning alert provides feedback when the lubricant reaches minimum level. The oil level can also be checked using a dipstick. The drive unit as a whole weighs some 47 kg. A sophisticated cooling concept ensures coolant flows through the cylinder head, entering at the front of the cylinder head on the hotter exhaust side . The water pump positioned on the right-hand side of the engine ensures circulation of 1.6 litres of coolant. Due to its high degree of efficiency, a relatively small surface is sufficient for heat dissipation in all conditions. Power is delivered from camshaft to a continuously variable gearbox (CVT) with automatic radial centrifugal dry clutch on the output shaft. Secondary power transmission to the rear wheel is taken care of by a gear stage that is positioned directly at the output shaft. The C 400 GT is additionally fitted with the automatic stability control system ASC, ensuring extra safety during acceleration even in adverse road conditions. The frame of the C 400 GT is a torsionally stiff tubular construction, with a solid cast iron unit in the area of the swing arm bearing. 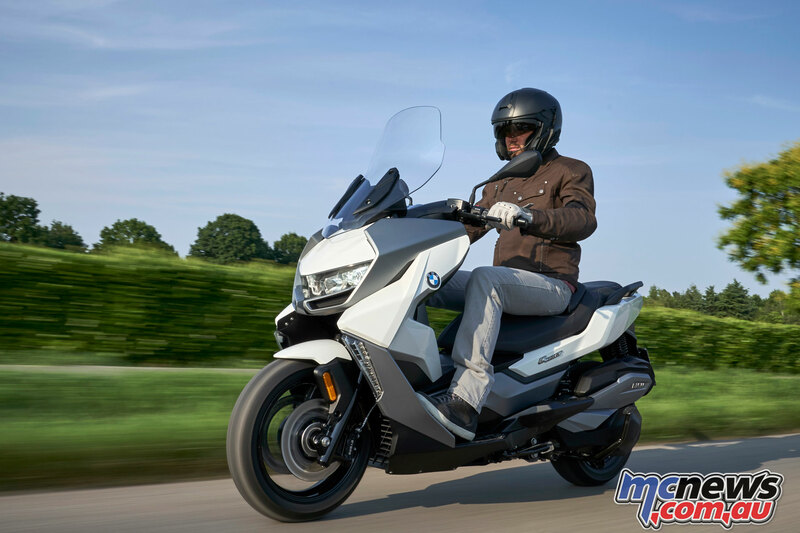 With a wheelbase of 1565mm, a steering head angle of 63.8 degrees and a castor of 81 mm, geometrical suspension data that are quite similar to those of a motorcycle. 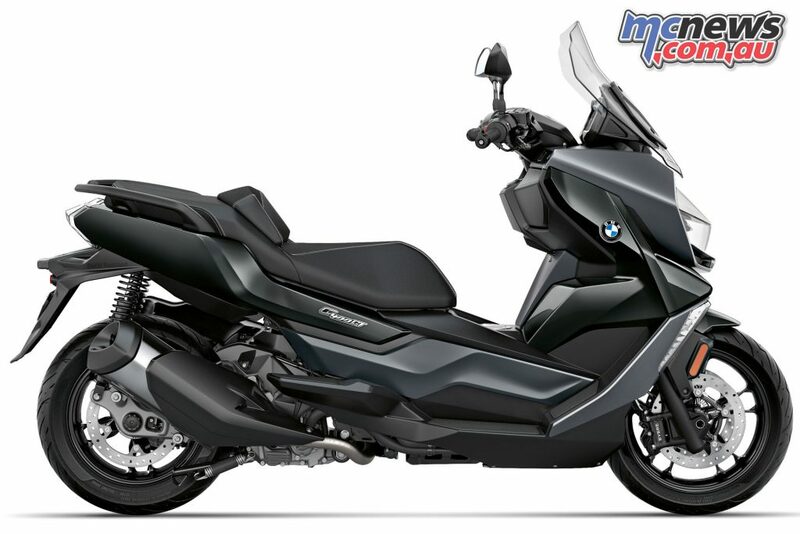 Rear wheel control is taken care of by the double-sided swing arm made of chill cast aluminium. It is a single unit supplemented with a bolted side cover for additional torsional stiffness. The job of suspension and damping is performed by two directly articulated spring struts. Generous spring travel of 112mm provides the basis for comfort and ride stability, and offers reserves for carrying a passenger and luggage. Front wheel control consists of a telescopic fork with a tube diameter of 35 mm and a spring travel of 110 mm. The C 400 GT rolls on light alloy diecast wheels, with the front boasting a 3.50 x 15 inch clad in a 120/70-15 tyre. The rear wheel is a 4.25 x 14 inch and it is fitted with a 150/60-14 tyre. The reduced rear wheel diameter of 14 inches at the rear allows the use of the flexcase for ample storage space. A Continental MK 100 MAB 2-channel ABS unit weighs just 700g, and is mated to a twin front disc brakes with a diameter of 270mm and two radially bolted four-piston floating calipers with a piston diameter of 28mm. On the rear a single disc brake with a diameter of 270mm and a single-piston floating caliper with a piston diameter of 32 mm are featured. High-quality braided steel brake lines are also fitted. 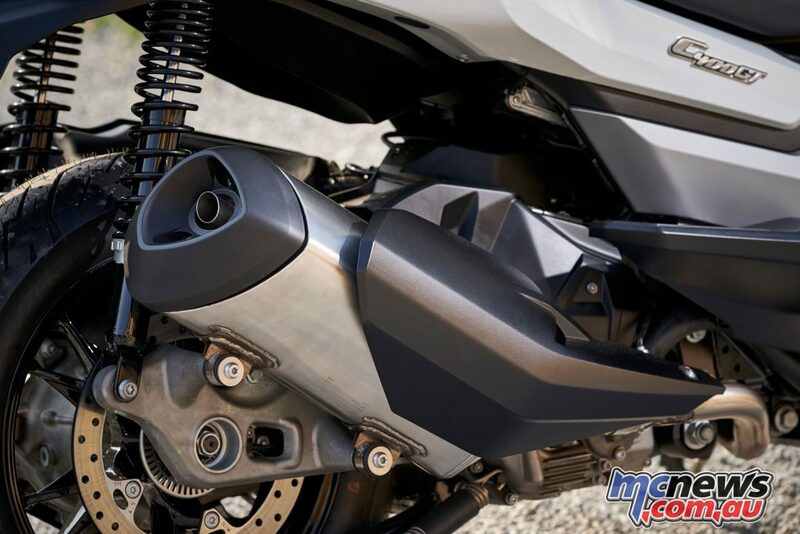 Both a side stand and a centre stand are fitted, with the latter including a cleverly devised kinematic system that makes propping up the motorcycle simple. 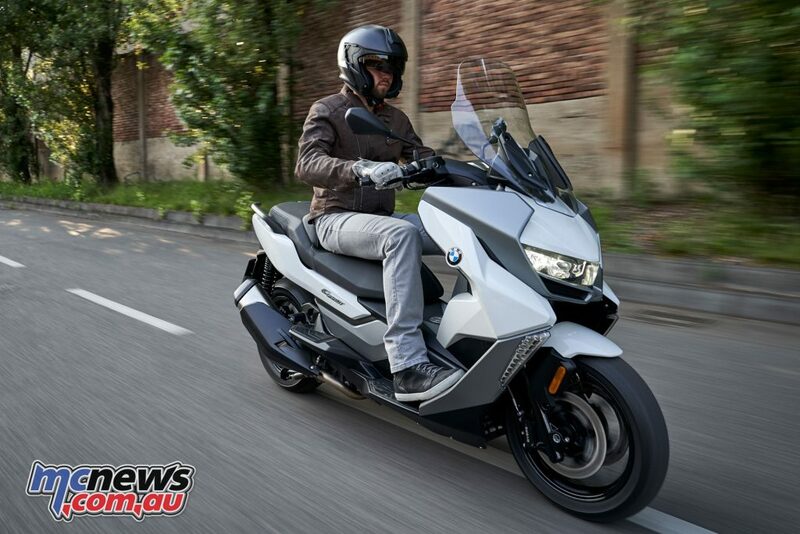 The electrical system of the C 400 GT is based on the system found in other BMW Motorrad models. It is a CAN (Controller Area Network) bus system. This means that the instrument cluster, the ABS and engine control unit, the electronic immobiliser and the optional alarm system (DWA) are all interconnected. A power socket in the right-hand storage compartment comes as a standard feature. 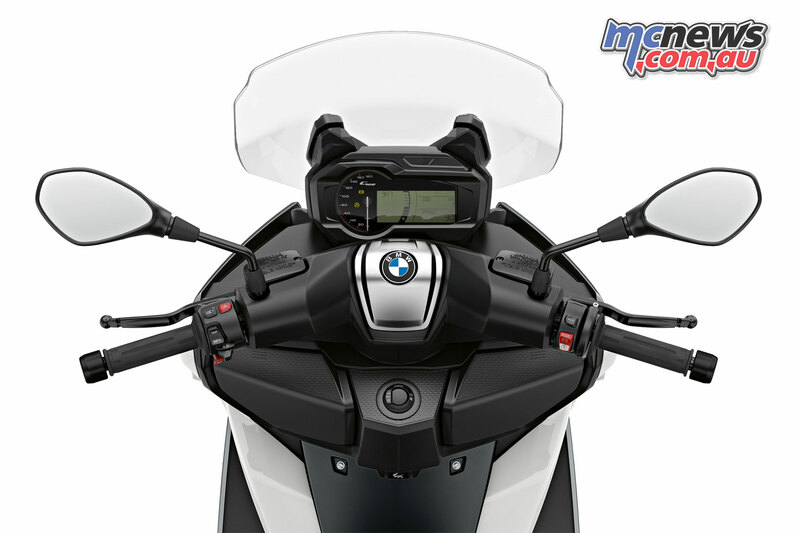 A mobile phone can be charged here during travel, while at the same time being connected to the BMW Motorrad Communication System in the rider’s helmet via Bluetooth. 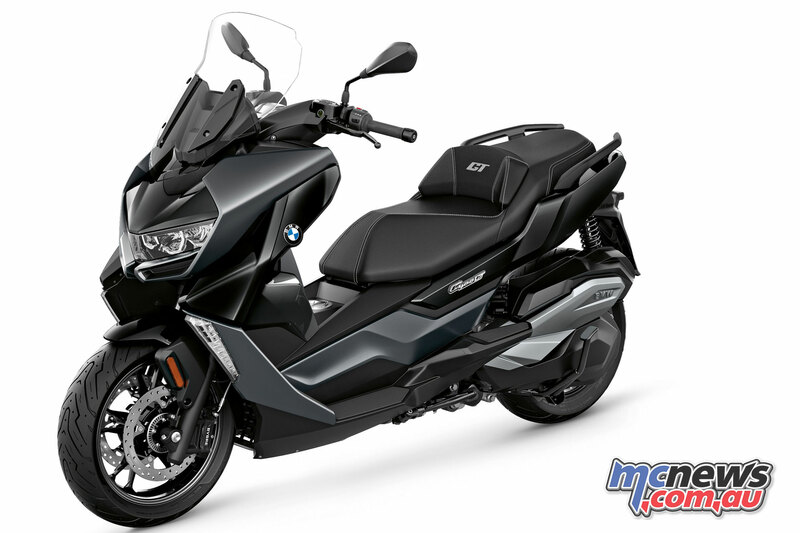 The wiring harness of the new BMW Motorrad midsize scooter is designed in such a way that all optional electrical equipment features such as heated grips and the alarm system can easily be retrofitted ex works; this also applies in the case of optional accessories or individual optional equipment items. 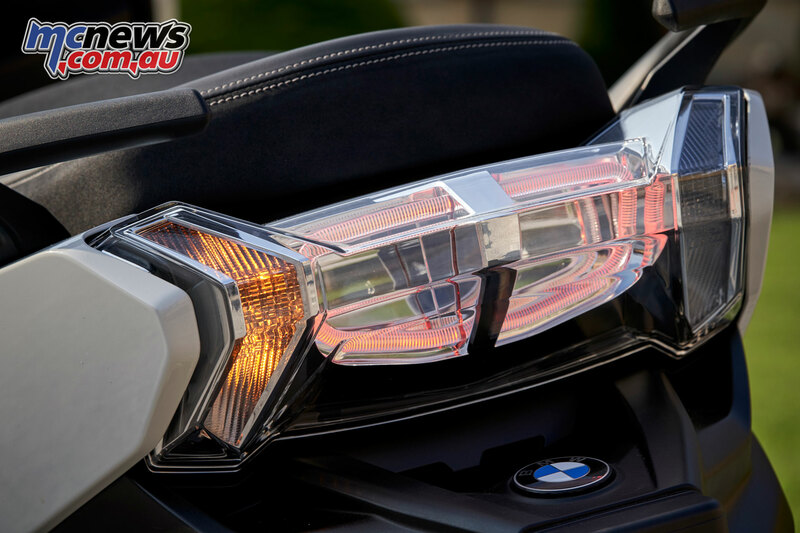 The C 400 GT also features highly luminous LED technology, as well as optional daytime riding light (country specific) in the new C 400 GT likewise features LED technology. 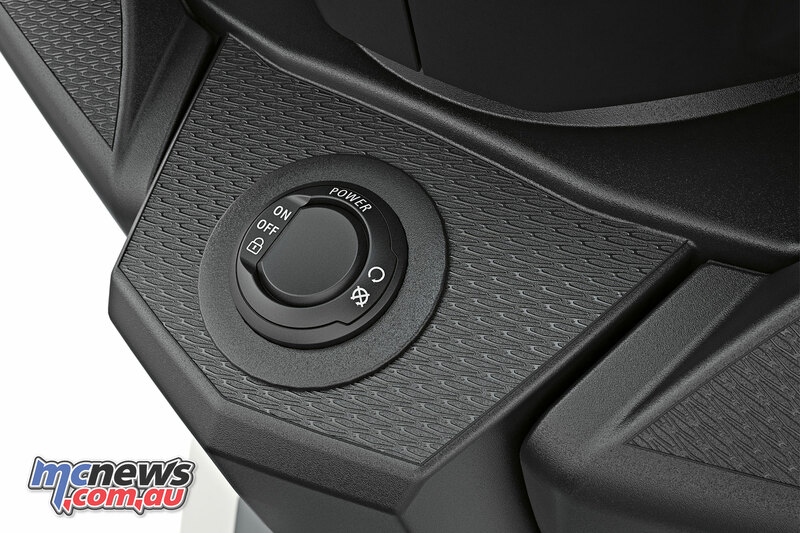 The front and turn indicators are organically integrated in the trim panel. The instrument cluster comprises a easily readable LCD screen with integrated engine speed display and an analog speedometer with a scale optimised for easy for reading. In addition, all indicator lights such as the ABS, engine and oil level lamps are integrated in the instrument cluster. 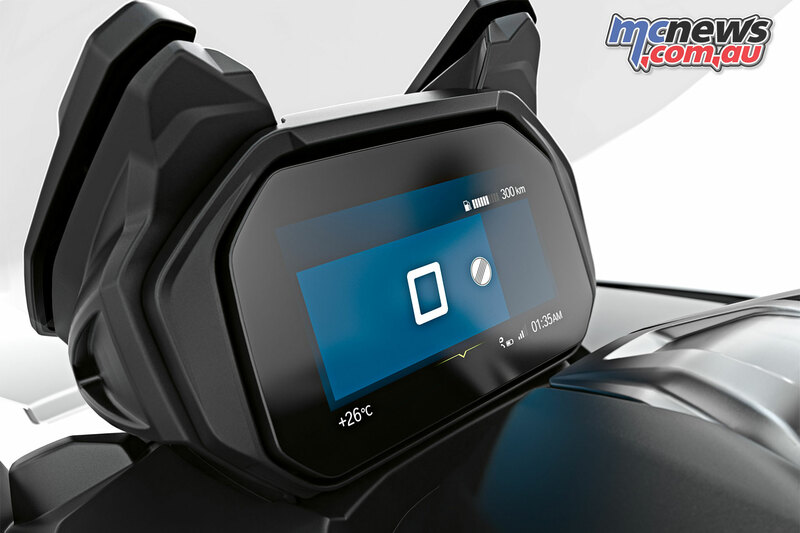 New optional equipment is the Connectivity package, featuring an instrument cluster in the form of a 6.5-inch full-colour TFT screen. In conjunction with the further advanced BMW Motorrad Multi-Controller offering integrated operation, it allows the rider to access vehicle and connectivity functions thanks to the BMW Motorrad Connected App available for free from the Google and Apple app stores. 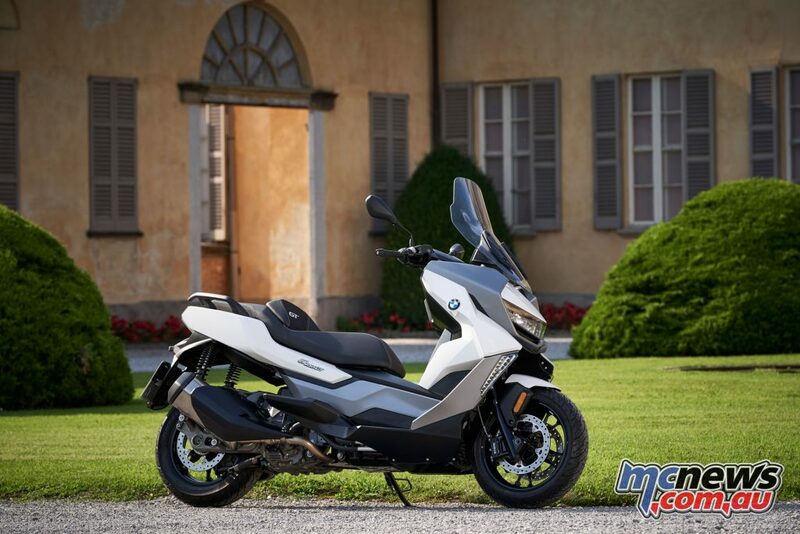 The new C 400 GT features a modern appearance, in the BMW Motorrad design philosophy. 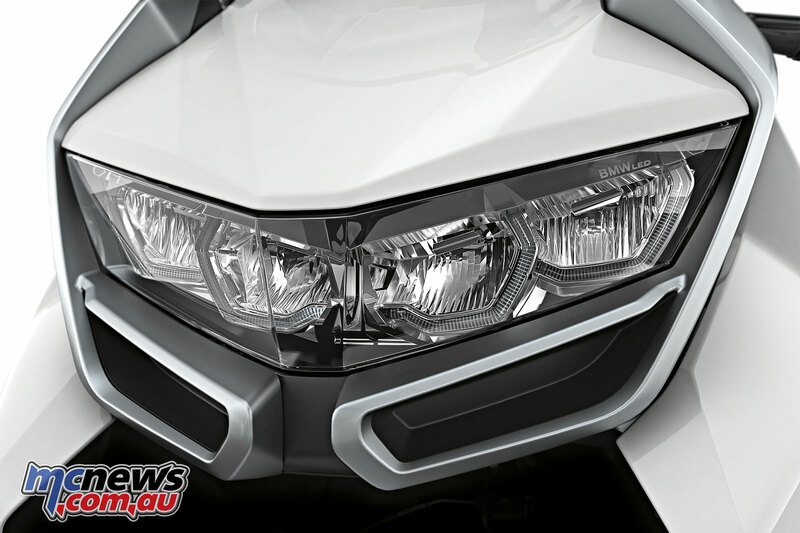 The front silhouette is dominated by the aerodynamically designed twin LED headlight with thedesign of the LED daytime running light (country-specific) in the form of fibre optic elements. 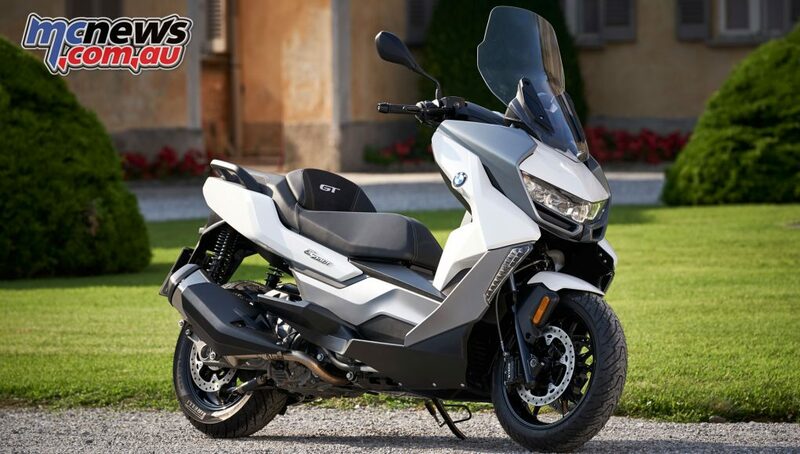 Bash plates – side trim elements at the front – underscore the new Gran Turismo membership of the BMW Motorrad family. The LED turn indicators are integrated in these, too, and the twin-tipped engine spoiler with integrated radiator grille is also a clear reference to BMW motorcycle design. 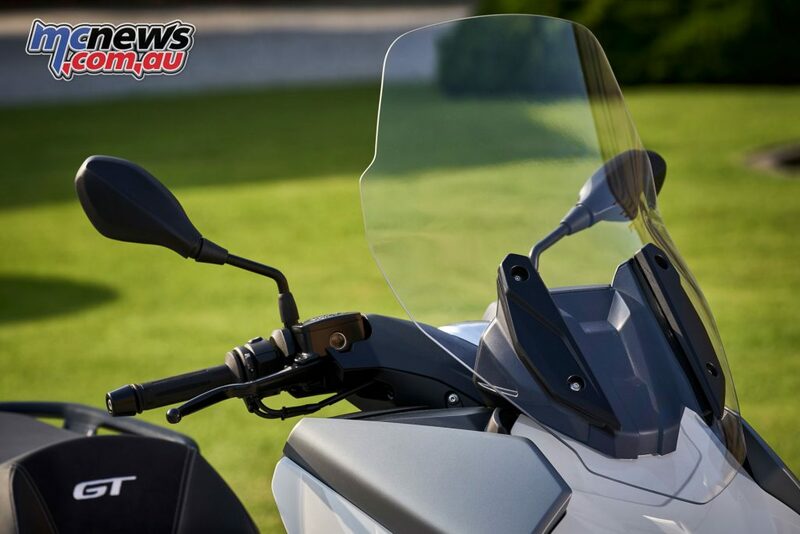 The windshield, which is higher than that of the C 400 X, was developed with the aim of increasing possible wind and weather protection as well as reducing wind noise to a minimum. 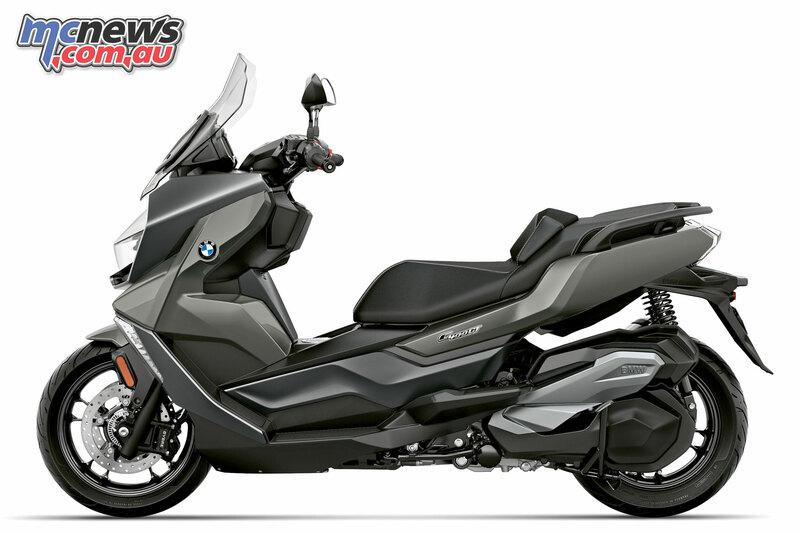 It is rigidly mounted on the trim and enables lengthier rides at higher speeds. 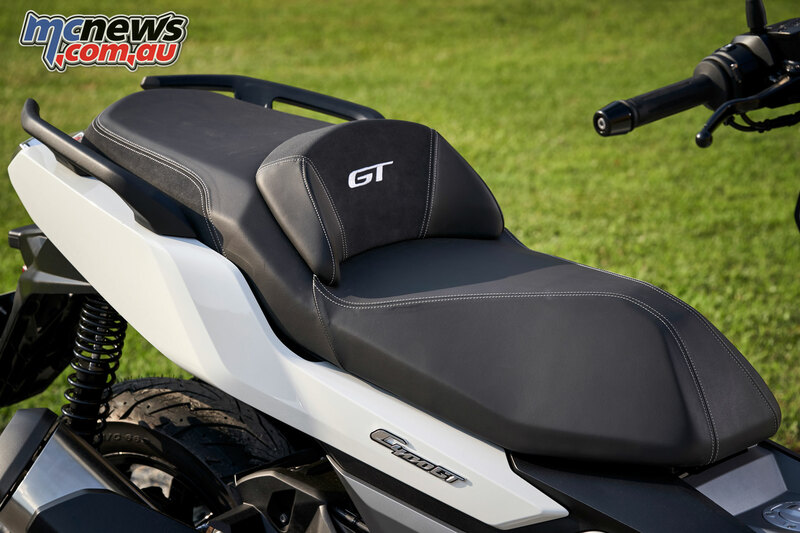 The seat height of the C 400 GT is 775mm, aiming to cater for taller riders and also has a separate rider backrest. A seat with a reduced height of 760 mm is available as an optional accessory. 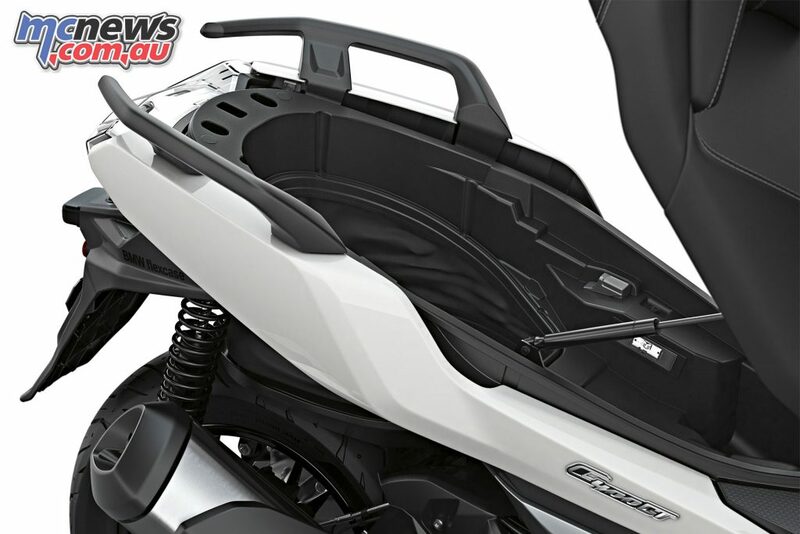 Both the rider’s and passenger’s feet rest on comfortable footboards integrated in the body. The generous storage space of the new C 400 GT also makes the scooter ideal for shopping trips into town, riding to work and even lengthier tours. The flexcase under the seat provides ample room and comprises a flap in the rear base which can be opened to provide a downward extension of the storage space. This versatility is enabled by the use of a rigid but pliable material based on Kevlar that creates a flexible but dirt-resistant, waterproof and durable connection between the flap and the rear base. 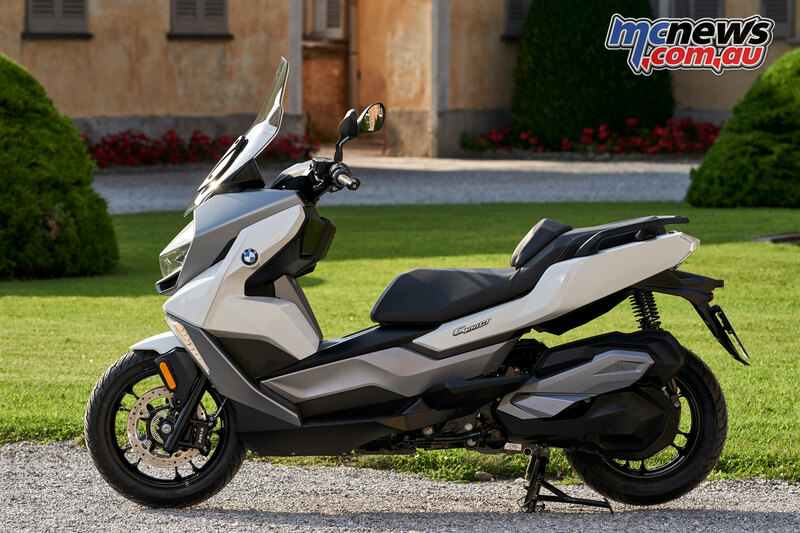 This storage solution by BMW Motorrad is able to accommodate an integral helmet and a jet helmet when the scooter is parked. The BMW flexcase is closed during travel. In the front section of the step-through there are two additional storage compartments, each of which is opened by means of a button. Both compartments are locked automatically with the scooter itself. 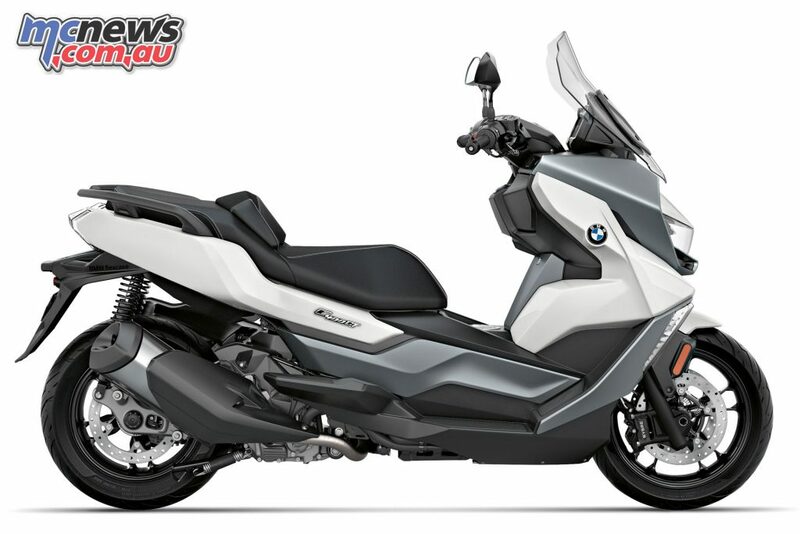 Keyless Ride controls the following lock functions: ignition, handlebars, seat, fuel filler cap and storage compartments. In the right-hand storage compartment there is also a 12-volt power socket for electronic devices. A USB adapter is also available as an optional accessory. The new C 400 GT can also be fitted with a luggage bridge (optional accessory) for transportation purposes that enables attachment of a topcase (also an optional accessory). The Alpine White colour sceme highlights the distinctive styling of the new C 400 GT. 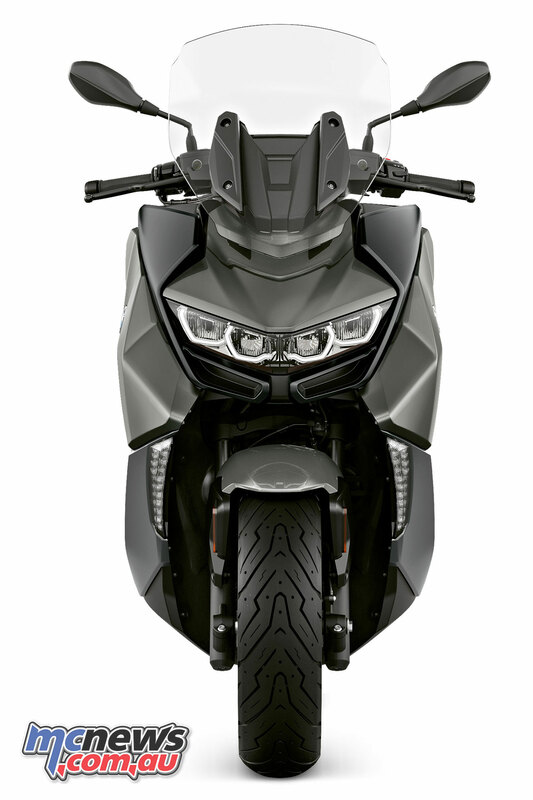 As an alternative, the paint finish Moonwalk Grey metallic is also available, as is the third paint finish – Blackstorm metallic.